Convert your excess material into cash with a consignment at KADEX Aero. Do you have legacy material from projects or aircraft that are long gone? Free up storage space for your next project. Leave the parts selling activity to us so your time is better directed. 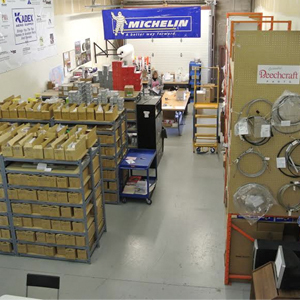 Your parts are inspected, catalogued, separated, segregated, stored in environmentally controlled warehouses, secured, insured, and accessible for your visit anytime. We report to you promptly and regularly on all sale activity, price and material listings. If certain minimum selling prices are necessary you establish all these controls. Once your material is inspected and listed, we market immediately on ILS, Parts Base, Controller, KADEXaero.com and direct mail. This gets a world-wide exposure 24/7/365 to 30,000 potential buyers. We monitor activity in the evening and on weekends to seize any opportunity as it presents itself. Call us today!